Steve Hansen graduated to a position in the All Blacks' coaching setup alongside Graham Henry in 2004, having succeeded Henry as the coach of Wales in 2002. Hansen's tenure in Wales was a troubled one, with 11 consecutive Test defeats prevented only by a win over Romania and a Six Nations wooden spoon in 2003 bringing rafts of criticism from the rugby-mad population. At the 2003 Rugby World cup however his side put in spirited performances in defeat to New Zealand and eventual champions England, laying the groundwork for Hansen's successor Mike Ruddock, who would oversee a Grand Slam in 2005. With the All Blacks, Hansen has worked with two Grand Slam-winning sides and coached Tri-Nations successes alongside Henry and Wayne Smith as well as a series win over the British & Irish Lions in 2005. Hansen was part of the coaching team that controversially was re-appointed following the All Blacks' exit from the 2007 Rugby World Cup. In 2009, criticisms of the All Blacks' forwards reached fever-pitch following losses to France and South Africa. Hansen was switched to attack duties, from forwards, while Henry accepted pack duties and Smith defence. The newly-branded coaching team then oversaw an unbeaten end-of-season tour of the northern hemisphere. Going into the 2011 World Cup, the All Blacks failed to secure the Tri-Nations after losing their final clash against the Wallabies. But with a World Cup on home soil, Henry's side had their eyes on the bigger prize. After suffering the blow of losing Dan Carter alongside the likes of Colin Slade and eventually Aaron Cruden, Henry's coaching side took rugby's biggest prize beating France in the final 8-7. 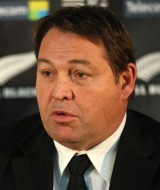 With Henry opting to call time on his tenure as All Blacks coach, Hansen was immediately thrust into the spotlight as the favourite to take on the post. And on December 16, 2011, Hansen was confirmed as the new boss of the World champions. At club level Hansen saw success with Canterbury and won NPC titles in 1997 and 2001 before graduating to Super Rugby with the Crusaders.